A different kind of Tag! FREE Stampin' Up catalogs...need to go! So, I was blog hopping and someone had taken this quiz. I decided I'd give it a shot and have a little fun. I know it has no real "scientific" value, but it's alway nice to do well! If you feel like it, have a go! I've been tagged again! This one is different from the others I've played before...I'm thinking this one is particularly fun. Tracy over here tagged me with this fun one! I need to add a question at the end and tag 2 other. Let's see I'm tagging...Catherine and Lori...looking forward to reading your answers sistahs! 4. Tell us two things that everyone pretty much knows about you: I love pink! And I'm a stamper *tongue in cheek* LOL! 9. What are two interesting (in a good or bad way) jobs you’ve had in your life? Little Caesar's Pizza (high school) & Nordstrom....I loved the makeup! 11. 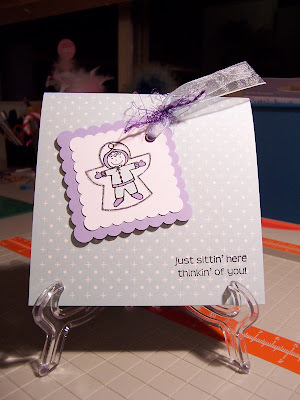 What two things would make your scrapping/stamping work space work even better for you? More space!!! *big grin* and larger standing work area. 13. What are your two favorite stamping tools? Bling!...rhinestones, glitter, glitter pens & ribbon! 15. What 2 times are the best for you to get stamping done: I seem to be most productive later in the evening. I've been going through my stamps and sorting out the ones I can bear to part with. There has actually been a pile of Stampin' Up stamps sitting in my craft room for some time now, I've just never gotten around to listing them. That's me, the ultimate procrastinator! I'm trying to work on that...but let's get back to the matter at hand, rubbah for sale! I've also got these listed on the BST trade board at SCS, so if you're interested in one don't wait! Most of these sets are already mounted and slightly used. Really, in all honesty, the ones that saw ink were only inked a few times. I really do need to use my stamps more! Some have not even been mounted yet. If you want to see pics of a certain set, let me know and I can get one taken or you can pop on over to SCS and see pics of the set in the gallery. I will send via Priority mail. 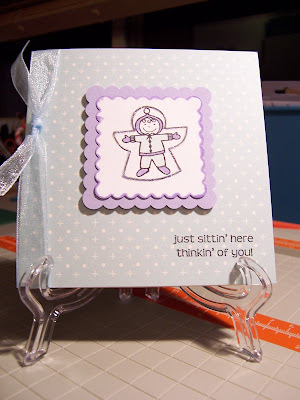 A Flat Rate envelope is $4.60 and usually holds one stamp set, a Flat Rate box is $8.95 (prices listed are for the U.S.). I will accept Paypal (preferred) and money orders. Your stamps will be sent out once payment is received. If you are outside the U.S. postage will be computed individually. I'm only mailing to the U.S. and Canada right now. If you're interested in any, send me an email to let me know so I can set it aside for you. Thanks for looking! 1. I've never been in a car accident...and praying that I never am! 2. I have never broken a bone...not one. 3. I got my Masters in Teaching and by the time I was done with the program and student teaching I figured out that I didn't want to teach in a classroom setting! I really believe that I will use what I learned in my Master's program to homeschool Bella and any others that come along. 4. I collect dolls and sew clothes with my mother. My mom has been collecting dolls since I was born and I grew up with them around and naturally got into it to. 5. I love getting pedicures...I would go every week if I could! But I limit it to mainly spring and summer time and even then its about every month or so. 6. I have a thing for Cherry Coke...Definitely need my caffeine! 7. My favorite color is pink! I love pink! Pink, pink, pink!!! I'm finally posting some cards...can you believe it?!?! 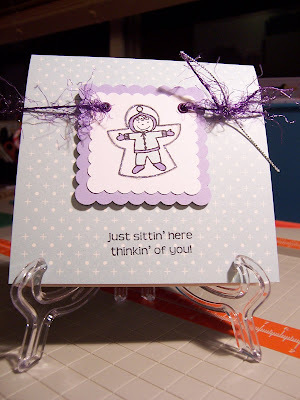 I'm amazed myself *hehehehe* It felt so good to actually take the time and create a card! Recently I've not been feeling my creative for card making. I know it's one of those things that will come back as I start to create...it's just so hard to get it started! Some of you will recognize these cards...they've already been sent and received! These colors have been floating around in my head for some time. I've been wanting to play with these pastel colors and actually see what they look like when they've been "put down" into a card. I'm pretty pleased with the results...simple, clean, fun. I think these colors remind me of a whimsical winter feel. I've been really into Amuse images recently and these cards are made using their stamps. I did three different cards that all use the same images, cardstock and colors, but I felt like mixing it up a bit with each card so they are all a little different. Just a quick note that your packages are sent! After a slight delay yesterday...my car battery was dead!...they got in the mail today!!! Whew...I never thought I'd get those out! I've been going through things in my craft room and I have an excess of catalogs I'd love to be rid of! So I've got a great deal for you! They are FREE....that's right FREE! All I'm asking is that you pay the shipping/handling to mail them. If you're interested please send me an email including: the items you'd like, your name, mailing address. I will accept money order or Paypal payments. These items will be sent the least expensive way possible (using USPS). If you prefer a specific delivery method, let me know in your email. Items will not be sent until payment is received. Note: Some of the catalogs have a sticker with my name and information on it. This is easily covered up and doesn't detract from the catalog at all. I owe you three *you know who you are :)* a big I'm sorry. Your goodie bags have been ready for some time now, but I've been missing packing tape!!! I know that should be no excuse, but I'm going to remedy it today. Packing tape is on my list for the store today! I will be getting them in the mail on Monday. Please forgive me! How cool is this?!? The gals over at Queen Kat Bloggers have asked me to be a featured blogger! Big excitement!